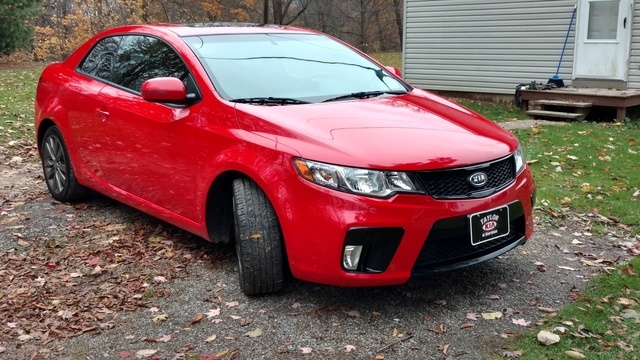 The 2-door Kia Forte Koup compact car gets a new tilt/telescopic steering wheel as a standard feature for 2012, but otherwise remains unchanged. Outside, the Koup receives a number of features not found on the Forte sedan and hatchback, including a front lip spoiler and airflow deflectors underneath the vehicle, which help reduce drag. Up front, a black mesh grille, swept-back auto on/off headlights and large lower front air intake give the Koup EX a sporty look. Other standard exterior features include dual chrome exhaust pipes, 16-inch alloy wheels and power side mirrors with integrated turn signals. Inside, the 5-passenger EX comes equipped with such standard features as front sport seats with side bolsters, remote keyless entry, steering-wheel-mounted audio and cruise controls, an outside temperature display and air conditioning. Power windows and door locks are also included. In addition, a 6-speaker AM/FM audio system includes Bluetooth and SiriusXM satellite radio, as well as a CD/MP3 player, a USB port, an auxiliary input jack and 2 tweeter speakers. The driver's seat features 6-way manual adjustment, while the rear seat splits 60/40 and folds down. A Technology Package adds a navigation system, a rear-view camera and push-button start, as well as a new Supervision instrument cluster for 2012. Power for the front-wheel-drive EX comes from a 2.0-liter 4-cylinder engine, which generates 156 hp and 144 lb-ft of torque. The engine connects to a 6-speed manual transmission, which comes standard, or an optional 6-speed automatic with a Sportmatic manual-shift feature. Fuel economy numbers check in at 24 mpg city/33 highway with the manual transmission and 25/34 with the automatic. Standard safety features include 6 airbags, as well as electronic stability control, traction control and 4-wheel antilock brakes with electronic brakeforce distribution and brake assist. The 2012 Kia Forte Koup SX compact car receives a number of exterior and interior features not found on the entry-level EX trim, including front foglights, gloss-black front accents and wraparound LED taillights, as well as a leather-wrapped steering wheel, a Supervision instrument cluster with red gauges and metal-finish interior accents and pedals. The SX also gets unique sport cloth seat upholstery with red stitching. The well-bolstered front sport seats include 6-way manual adjustment for the driver, while the rear seatback splits 60/40 and folds flat. Remote keyless entry, steering-wheel-mounted audio and cruise controls, an outside temperature display, air conditioning and power windows and door locks are among the other standard features for the SX. In addition, a 6-speaker AM/FM audio system includes Bluetooth and SiriusXM satellite radio, as well as a CD/MP3 player, a USB port, an auxiliary input jack and 2 tweeter speakers. A Leather Package adds leather upholstery, heated front seats and an auto-dimming rear-view mirror, while a Technology Package includes a navigation system, a rear-view camera and push-button start. Outside, the 2-door, front-wheel-drive SX displays a sporty look, thanks to a front lip spoiler, black mesh grille and large lower front air intake. In addition, airflow deflectors underneath the vehicle help reduce drag. Other exterior features for the SX include swept-back auto on/off headlights, dual chrome exhaust pipes, 17-inch alloy wheels and power side mirrors with integrated turn signals. For power, the SX continues to come equipped with a 2.4-liter 4-cylinder engine, which develops 173 hp and 168 lb-ft of torque. The engine mates to either a 6-speed manual transmission, which comes standard, or an optional 6-speed automatic with a Sportmatic manual-shift feature. When equipped with the automatic transmission, the SX gets steering-wheel-mounted paddle shifters as a standard feature. Fuel economy numbers check in at 22 mpg city/32 highway with the manual transmission and 23/31 with the automatic. Standard safety features include 6 airbags, as well as electronic stability control, traction control and 4-wheel antilock brakes with electronic brakeforce distribution and brake assist.